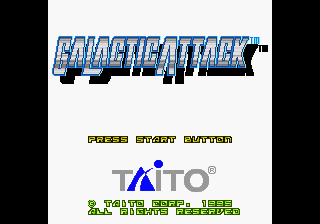 Galactic Attack, known as Layer Section (レイヤーセクション) in Japan, is a shoot-'em-up published by Acclaim (US and Europe) or Taito (Japan) for the Sega Saturn. It is the home conversion of Taito's 1993 arcade game RayForce, otherwise known as Gunlock, ported by Ving. The game can be played both in standard mode and "tate" mode, which requires the display to be rotated by 90°. Some scaling and scrolling background effects can be only seen in tate mode. A standard shot which fires straight forwards when is held, which can be powered up by collecting red and yellow items. While the game's outfire is alread very fast (presumeable a 1/15 frequency), a higher firing rate can be acchived by turning off the game's default autofire and using an autofire device. A"Lock On Laser", which is used to target enemies in the background. A cursor in front of the player's ship automatically targets enemies up to a certain number, then pressing fires missiles which destroy or damage all the targets simultaneously. The original maximum amount of targets is five, but this can be increased to eight by collecting blue-green slabs with an "L" on them. The higher the amount of locked on enemies, the higher the score bonus. Increase credits: Credit is doubled to 8. In title screen, by holding + + + . A Layer Section II was later released for Saturn; this is a port of the sequel to RayForce, RayStorm. The use of PlayStation-esque hardware also compelled a port to that platform, under the original RayStorm name. The reason for the name has been changed from RayForce to Layer Section is due to trademark issues. Main article: Galactic Attack/Magazine articles.